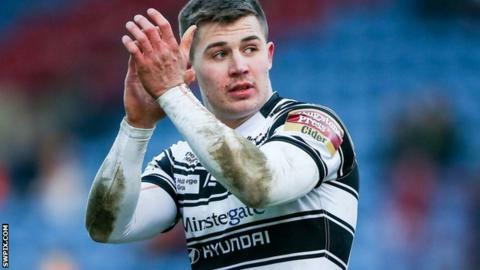 Hull FC shocked high-flying St Helens to win only their third game of the season. The hosts led by two points at the break through Tommy Makinson and Louie McCarthy-Scarsbrook with Jamie Shaul and Curtis Naughton replying for Hull. Leon Pryce went over to give the visitors the lead before Jordan Turner put the hosts back in front. Fetuli Talanoa gave the Black and Whites the lead once more before Shaul's second try sealed victory. Hull took an early lead when Joe Westerman and Pryce combined to create the space for Shaul to slip through with Jordan Rankin adding the kick to make it 6-0. But nice work from Lance Hohaia and James Roby sent the supporting Makinson skipping through and he kicked the goal to level the scores. Saints were soon back for more as a lovely short ball from Turner sent McCarthy-Scarsbrook powering over the line, with Makinson again adding the goal. The to-and-fro nature of the game continued, with a pair of Hull penalties giving them a great position to have another crack before winger Naughton just managed to get the ball down despite Ricky Bailey's tackle to cut the deficit to 12-10 on 24 minutes. Lee Radford's side hit the front eight minutes into the second half when Saints' old boy Pryce made a telling intervention. Attacking the line, he got the ball down despite being tackled before Rankin's goal made it 16-12 to the visitors. Turner, playing against his former club, showed some determination in driving towards the posts and Makinson's strike put Saints 18-16 ahead. Hull then forced an error when Hohaia was adjudged to have knocked on a high Pryce kick. From there, the visitors piled on the pressure, which told on 66 minutes when a floated wide ball sent Fetuli Talanoa over. Rankin missed the goal and a penalty from a high tackle allowed Makinson to level from 30 metres nine minutes from time, but Saints were hanging on. Shaul showed a great turn of pace and nimble footwork to turn Makinson inside out to run in from halfway. Rankin landed his third kick of the day and, to compound Saints' misery, the restart kick went out on the full before Rankin slotted another penalty to make the game safe with three minutes to play. "I still feel the squad of players we have is more than adequate to win the games that they have been involved in. "They gave a really good showing at Wigan on Friday, but I am deeply disappointed with a few individuals in the side today. "I thought a lot of people really busted their bodies and tried their best out there. But there were a few individuals out there who can count themselves very lucky that we have a few injuries." "I am really pleased for the group, the team and the owner. "It has been a really difficult camp from Thursday's result and the manner of the defeat. "On the back of that disappointment, to pull ourselves off the canvas like we did, was impressive. "If we had been smarter, it could have been easier but fatigue plays a massive part in this Easter Monday fixture." St Helens: Makinson; Bailey, Dawson, Ashworth, Swift; Turner, Hohaia; Amor, Roby, Masoe, Jones, McCarthy-Scarsbrook, Savelio. Replacements: Walmsley, Flanagan, Thompson, Richards. Hull: Shaul; Lineham, Michaels, Talanoa, Naughton; Pryce, Rankin; Paea, Howarth, Bowden, Hadley, Minichiello, Westerman. Replacements: Houghton, Paleaaesina, Thompson, Cunningham.